"=" and "＝" redirect here. For double hyphens, see Double hyphen. For other uses, see Equal (disambiguation). For technical reasons, ":=" redirects here. For the computer programming assignment operator, see Assignment (computer science). For the definition symbol, see List of mathematical symbols § Symbols based on equality. The equals sign or equality sign (=) is a mathematical symbol used to indicate equality. It was invented in 1557 by Robert Recorde. In an equation, the equals sign is placed between two (or more) expressions that have the same value. In Unicode and ASCII, it is U+003D = EQUALS SIGN (HTML &#61;). The etymology of the word "equal" is from the Latin word "æqualis" as meaning "uniform", "identical", or "equal", from aequus ("level", "even", or "just"). The first use of an equals sign, equivalent to 14x+15=71 in modern notation. From The Whetstone of Witte (1557) by Robert Recorde. And to avoid the tedious repetition of these words: is equal to: I will set as I do often in work use, a pair of parallels, or Gemowe lines of one length, thus: =, because no 2 things, can be more equal. The symbol '=' was not immediately popular. The symbol || was used by some and æ (or œ), from the Latin word aequalis meaning equal, was widely used into the 1700s. In mathematics, the equals sign can be used as a simple statement of fact in a specific case (x = 2), or to create definitions (let x = 2), conditional statements (if x = 2, then …), or to express a universal equivalence (x + 1)2 = x2 + 2x + 1. The first important computer programming language to use the equals sign was the original version of Fortran, FORTRAN I, designed in 1954 and implemented in 1957. In Fortran, "=" serves as an assignment operator: X = 2 sets the value of X to 2. This somewhat resembles the use of "=" in a mathematical definition, but with different semantics: the expression following "=" is evaluated first and may refer to a previous value of X. For example, the assignment X = X + 2 increases the value of X by 2. A rival programming-language usage was pioneered by the original version of ALGOL, which was designed in 1958 and implemented in 1960. ALGOL included a relational operator that tested for equality, allowing constructions like if x = 2 with essentially the same meaning of "=" as the conditional usage in mathematics. The equals sign was reserved for this usage. Both usages have remained common in different programming languages into the early 21st century. As well as Fortran, "=" is used for assignment in such languages as C, Perl, Python, awk, and their descendants. But "=" is used for equality and not assignment in the Pascal family, Ada, Eiffel, APL, and other languages. A few languages, such as BASIC and PL/I, have used the equals sign to mean both assignment and equality, distinguished by context. However, in most languages where "=" has one of these meanings, a different character or, more often, a sequence of characters is used for the other meaning. Following ALGOL, most languages that use "=" for equality use ":=" for assignment, although APL, with its special character set, uses a left-pointing arrow. Fortran did not have an equality operator (it was only possible to compare an expression to zero, using the arithmetic IF statement) until FORTRAN IV was released in 1962, since when it has used the four characters ".EQ." to test for equality. The language B introduced the use of "==" with this meaning, which has been copied by its descendant C and most later languages where "=" means assignment. The equals sign is also used in defining attribute–value pairs, in which an attribute is assigned a value. In PHP, the triple equals sign (===) denotes value and type equality, meaning that not only do the two expressions evaluate to equal values, they are also of the same data type. For instance, the expression 0 == false is true, but 0 === false is not, because the number 0 is an integer value whereas false is a Boolean value. In Ruby, equality under == requires both operands to be of identical type, e.g. 0 == false is false. The === operator is flexible and may be defined arbitrarily for any given type. For example, a value of type Range is a range of integers, such as 1800..1899. (1800..1899) == 1844 is false, since the types are different (Range vs. Integer); however (1800..1899) === 1844 is true, since === on Range values means "inclusion in the range". Note that under these semantics, === is non-symmetric; e.g. 1844 === (1800..1899) is false, since it is interpreted to mean Integer#=== rather than Range#===. The equals sign is sometimes used in Japanese as a separator between names. The equals sign is also used as a grammatical tone letter in the orthographies of Budu in the Congo-Kinshasa, in Krumen, Mwan and Dan in the Ivory Coast. The Unicode character used for the tone letter (U+A78A) is different from the mathematical symbol (U+003D). The signature of Santos-Dumont, showing a hyphen that looks like an equal sign. A possibly unique case of the equals sign of European usage in a person's name, specifically in a double-barreled name, was by pioneer aviator Alberto Santos-Dumont, as he is also known not only to have often used an equals sign (=) between his two surnames in place of a hyphen, but also seems to have personally preferred that practice, to display equal respect for his father's French ethnicity and the Brazilian ethnicity of his mother. In linguistic interlinear glosses, an equals sign is conventionally used to mark clitic boundaries: the equals sign is placed between the clitic and the word that the clitic is attached to. In chemical formulas, the two parallel lines denoting a double bond are commonly rendered using an equals sign. In recent years, the equals sign has been used to symbolize LGBT rights. The symbol has been used since 1995 by the Human Rights Campaign, which lobbies for marriage equality, and subsequently by the United Nations Free & Equal, which promotes LGBT rights at the United Nations. ≒ (U+2252, LaTeX \fallingdotseq), commonly used in Japan, Taiwan and Korea. The symbol used to denote inequation (when items are not equal) is a slashed equals sign "≠" (U+2260; 2260,Alt+X in Microsoft Windows). In LaTeX, this is done with the "\neq" command. Most programming languages, limiting themselves to the 7-bit ASCII character set and typeable characters, use ~=, !=, /=, or <> to represent their Boolean inequality operator. The triple bar symbol "≡" (U+2261, LaTeX \equiv) is often used to indicate an identity, a definition (which can also be represented by U+225D "≝" or U+2254 "≔"), or a congruence relation in modular arithmetic. The symbol "≘" can be used to express that an item corresponds to another. The symbol "≅" is often used to indicate isomorphic algebraic structures or congruent geometric figures. Equality of truth values, i.e. bi-implication or logical equivalence, may be denoted by various symbols including =, ~, and ⇔. The equals sign is sometimes used incorrectly within a mathematical argument to connect math steps in a non-standard way, rather than to show equality (especially by early mathematics students). This difficulty results from subtly different uses of the sign in education. In early, arithmetic-focused grades, the equals sign may be operational; like the equals button on an electronic calculator, it demands the result of a calculation. Starting in algebra courses, the sign takes on a relational meaning of equality between two calculations. Confusion between the two uses of the sign sometimes persists at the university level. ^ See also geminus and Gemini. 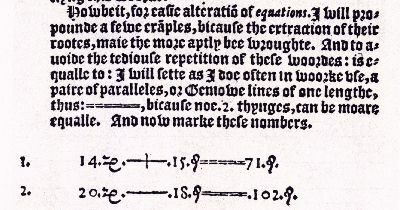 ^ Recorde, Robert, The Whetstone of Witte … (London, England: Jhon Kyngstone, 1557), the third page of the chapter "The rule of equation, commonly called Algebers Rule." ^ "Robert Recorde". MacTutor History of Mathematics archive. Retrieved 19 October 2013. ^ "Comparison Operators". PHP.net. Retrieved 19 October 2013. ^ why the lucky stiff. "5.1 This One's For the Disenfranchised". why's (poignant) Guide to Ruby. Retrieved 19 October 2013. ^ Rasmussen, Brett (30 July 2009). "Don't Call it Case Equality". pmamediagroup.com. Retrieved 19 October 2013. ^ Peter G. Constable; Lorna A. Priest (31 July 2006). Proposal to Encode Additional Orthographic and Modifier Characters (PDF). Retrieved 19 October 2013. ^ Hartell, Rhonda L., ed. (1993). The Alphabets of Africa. Dakar: UNESCO and SIL. Retrieved 19 October 2013. ^ "Unicode Latin Extended-D code chart" (PDF). Unicode.org. Retrieved 19 October 2013. ^ Gray, Carroll F. (November 2006). "The 1906 Santos=Dumont No. 14bis". World War I Aeroplanes. No. 194: 4. ^ "Conventions for interlinear morpheme-by-morpheme glosses". Retrieved 2017-11-20. ^ "HRC Story: Our Logo." The Human Rights Campaign. HRC.org, Retrieved 4 December 2018. ^ a b "Mathematical Operators" (PDF). Unicode.org. Retrieved 19 October 2013. ^ Capraro, Robert M.; Capraro, Mary Margaret; Yetkiner, Ebrar Z.; Corlu, Sencer M.; Ozel, Serkan; Ye, Sun; Kim, Hae Gyu (2011). "An International Perspective between Problem Types in Textbooks and Students' understanding of relational equality". Mediterranean Journal for Research in Mathematics Education. 10 (1–2): 187–213. Retrieved 19 October 2013.